Kmart.com orders from their $7.50 TVC sale are showing up, and as most others, my order was wrong. The above figures do not appear to be Death Troopers or Dr. Aphra. Personal Note: At least these figures arrived very mint on package (they handled the contents way better than I expected and these might be the best condition cardbacks on TVC that I’ve seen), but it’s still not what I ordered. I’m too lazy to go through the hassle of returning these, and will find a customizing use for the figures, but I won’t be ordering from them again. For anything. And I apologize to any of our readers that got duped like I did. 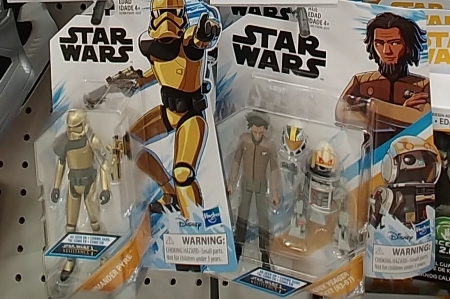 Target stores officially can start selling Resistance figures tomorrow, January 15. So if you are on the hunt for these, or have been turned down because of Target enforcing the street date (which is ridiculous considering how low key this show is), then be on the lookout starting tomorrow. 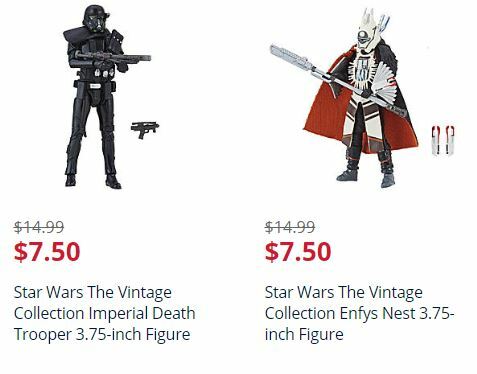 Kmart.com has listed newer TVC figures for $7.50 – you can find the listing by clicking here. UPDATE – Based on comments from collectors who have ordered from Kmart online, the experience hasn’t been great. Some have received poorly packaged figures and sometimes incorrect product. So… order at your own risk, and I’ll be sure to post a report once I receive my order (err… I mean… if I receive it) . 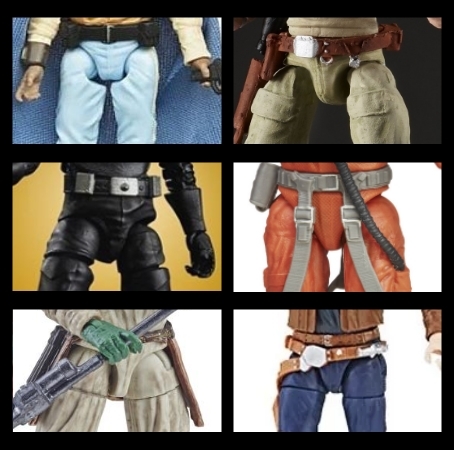 As an adult 3.75″ collector since 1995, I’ve seen Hasbro approach figure articulation and aesthetics in many forms… and here were are almost 25 years later, and it seems in some ways, Hasbro has taken a step back with aesthetics (at least compared to figures from 10 years ago). What I mean is articulation is needed – I love when figures have a wide range of ball joints – but there are some times when it feels as though Hasbro goes overboard, especially with how they are engineering the hips on figures now. In some cases, it’s fine – but it doesn’t seem like Hasbro is in the “Goldilocks Zone” anymore when it comes to articulation… it’s either too little (5poa style) , or too much. Thoughts? Do you like the way these figures are designed these days, or to do prefer the style from about 10 years ago? Share your opinions here or in the forums! Holeinthegroundpro has added several new goodies for all you 3.75″ diorama and playset fans. Check out the latest offerings by clicking the image above, or share your thoughts here or in the forums. I went by my local Five Below yesterday to see how many TBS figures were left after Christmas… and it was a lot. After being down to just stacks of Jyn, Cassian, and Krennic, they had restocked the pegs yet again to the max with more figures. Any guesses as to what other 6″ waves they might be getting in after the Baze / Chirrut wave? Or will it be isolated to just this one wave getting dumped there? Share your thoughts after the jump! Target stores are putting Force Link items on clearance now that the Christmas rush is over. Chances are these will be marked down lower in the coming weeks. 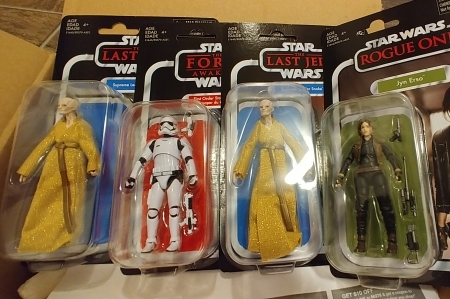 Personal Note: My local store only had the single figures marked on clearance, and the 2-pks with “The Last Jedi” label marked down. The “Solo” 2-pks were still scanning at full price. I didn’t bother to scan anything else.